A new logo and brand strategy established the Museum of Glass as a must-see attraction in Tacoma. On-site photography captured the beauty and artistry of the new Museum of Glass. As a new attraction in the Puget Sound, the Museum of Glass (MOG) faced competition from more well-known attractions in the region. Particularly, the staff needed a development strategy to support the museum well beyond its opened in July 2001. MOG hired Trio Group to guide them in creating systems and materials that would support development outreach including a membership program and all outgoing materials. We were asked to design a new brand experience and strategy to replace a logo that did not accurately represent the museum, craft a marketing and development strategy to build a thriving membership base, and provide support of the museum store and retail operations. We began by working with Museum of Glass staff to define their ultimate goal of establishing, increasing, and up-selling memberships. Our secondary objective was to create a new image for the facility and introduce it to the public at large. This involved shifting market perception of the museum—most Tacoma residents viewed MOG as a static museum—to the reality that the attraction was highly creative and interactive, especially the Hot Shop where glass artisans worked most days. 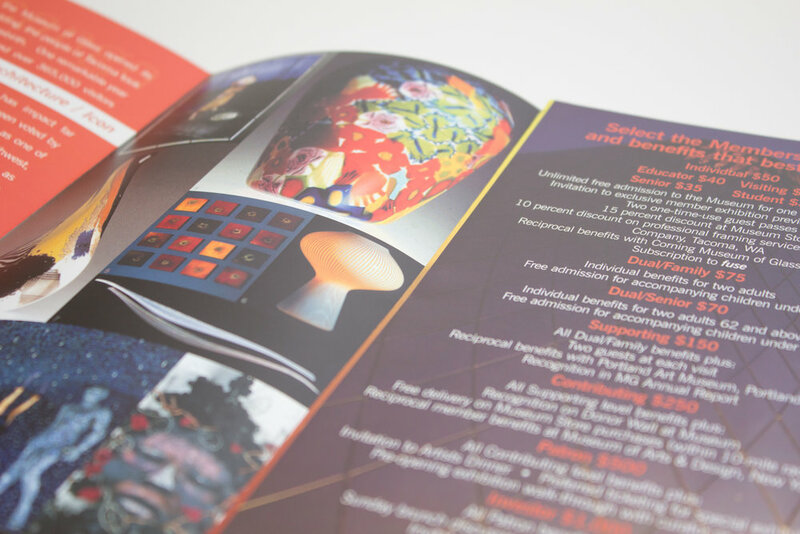 Our multifaceted strategy included a wide range of channels and media including variable data printing to personalize direct mail pieces, video production, photography and image development, brand standards, and even gift shop packaging. As our work progressed, we found new opportunities to support MOG including the naming, design, and layout of the museum's FUSE Magazine; standardization of outreach and design materials including apparel, museum exhibit books and materials; training museum staff in development and marketing strategy; as well as supporting the development of the MG 100 VIP donor group for sustained financial stability. Gorgeous photography and design presented the Museum of Glass as an exciting addition to the Tacoma ecosystem of attractions. Hand-drawn illustrations in colors reflecting the vibrancy of the glass artwork created on-site captured the excitement at the heart of the Museum of Glass. Thank you! One of our team members will be in touch shortly. If your business needs a new logo or a refreshed brand identity, get in touch! Trio designed and photographed much of the museum to create the launch book which featured a raised logo on the cover. Creative paper overlays emulate the translucency of glass. Bright photography and compelling copy from Trio made this a collector's item for the inaugural museum members. Iconic exhibits take center stage on greeting cards for the gift shop. 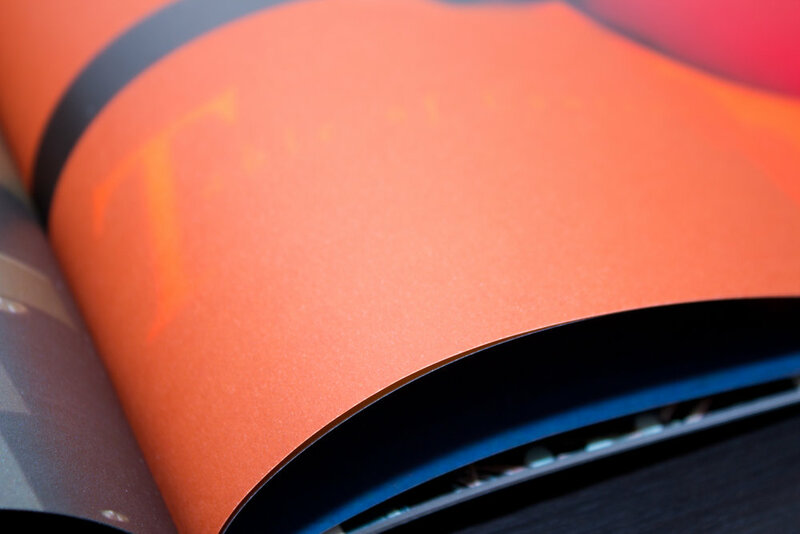 We named, designed, photographed, and produced the museum's flagship magazine, FUSE. Clear pricing and exciting photography grew the Museum's membership to over 8,000. Gorgeous photography highlights the vibrancy of MOG's exhibits. Our membership development efforts grew the Museum of Glass’s membership from several hundred to over 8,000 when the doors opened in 2001. When our work with MOG ended in 2008, the museum had taken over its own development and marketing efforts with great success as evidenced by the museum’s swelling membership ranks and growing regional presence. 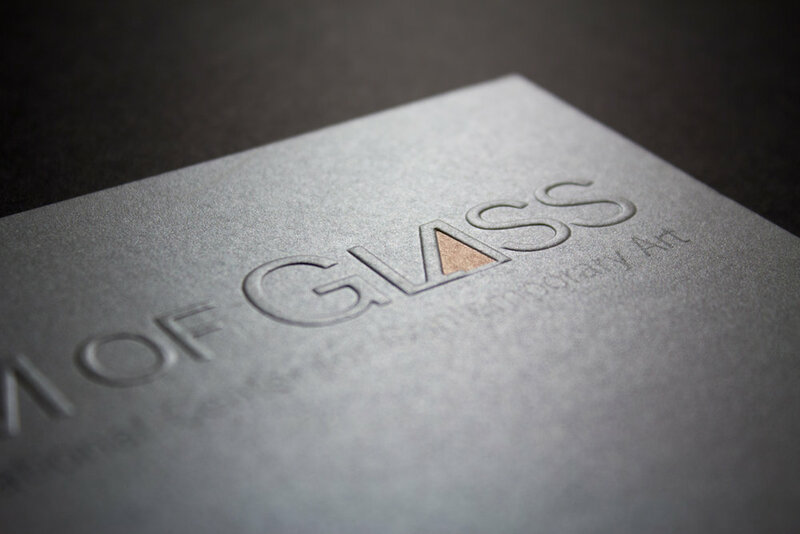 Additionally, Museum of Glass continued to use the logo and brand identity we designed for over a decade.